In the past three decades, Christian church bodies have attempted to rediscover the value of small group faith–sharing and Bible study. Both faith-sharing and Bible study allow Christians to connect in a personal way with the Word of God and with one another. That connection is what The Word of Life! proposes through small group study. In a confortable setting with three to twenty people, participants will be at ease sharing their faith with others and inviting their family, friends and others to join. The Word of Life! contains three series for faith–sharing within twelve months, and each series contains six sessions. When we share something, we are normally left with less of it ... or none; when we share our faith, however, we are left with more than we started with. We grow in it and we bless others with the faith the Holy Spirit has worked in our lives. This process is therefore guaranteed to be rewarding. The Word of Life! 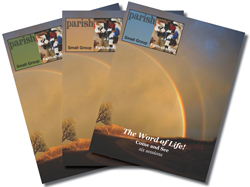 series consists of three separate 32–page, 8½" x 11" study guides in downloadable PDF format with re–print rights for the entire congregation, or printed format (black & white). Purchase them one at a time or save 20% by getting all three. The guides are organized to lead a group, or can be easily emailed to, or printed for participants to follow along. Click to view Sample. Come and See! The first series offers participants the opportunity to answer Jesus’ question, “Who do you say I am?” While members may invite family, friends, relatives, neighbors, colleagues and others to the faith–sharing meetings, it is preferable, however, that the participants do not make an effort to invite others yet. The members of a congregation should first meet amongst themselves to share their faith with one another, so that when they invite others to join, they may have had enough experience sharing their faith with one another. Go and Tell! allows participants to reach out to their families, friends and other acquaintances and invite them to join the faith–sharing. The existing participants will have experienced faith–sharing and will now be better prepared to tell others about its benefits and lead them in faith–sharing! Dwell in My Love! explores the great commandment of love. Its call to dwell in God’s love goes beyond the six weeks of sharing your faith. The call to dwell in God’s love is a call that is addressed to each one of us for the rest of our life in this world; we are called to dwell in God’s love as long as we live, by loving God above everything, and loving others the way we love ourselves. The participants will make a greater effort in inviting others. Save by purchasing all three! • Re–print rights for the entire congregation!